Entering the museum one descends into the earth. 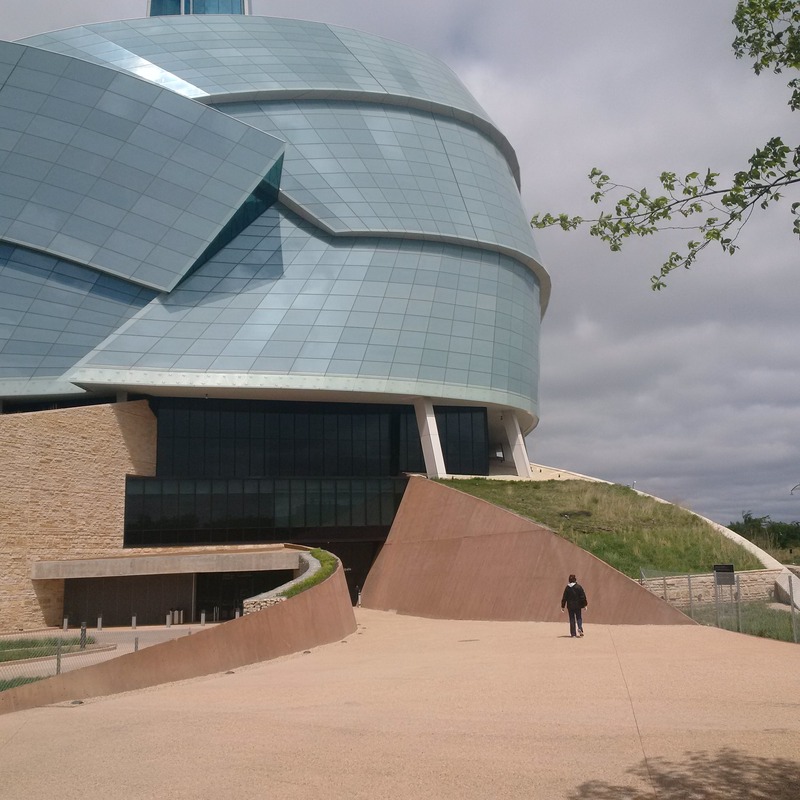 During our recent visit to Winnipeg we visited the new Canadian Museum for Human Rights. I am not a museum person but this was a real learning experience that I enjoyed. The first national museum built in Canada outside Ottawa, it required a change in the Museums Act. It was business leader Izzy Asper, founder of Canwest, who brought forward the idea of a Canadian museum of human rights. He saw it as a place where students could learn about human rights. He also wanted to bring new life to central Winnipeg and attract visitors from Canada and the world. The Museum stands on Treaty One territory, not far from the place where the Métis rebelled under Louis Riel in 1870. Treaty One was Canada’s first treaty after Confederation. It was signed in 1871 and covered the relationship between Canada and the First Nations in Manitoba. Archeologists dug into the land here before construction began and found more than half a million objects that tell the story of the site. The Holocaust display had the most memorable impact on me. The answer to the ‘problem’ was not assimilation but extermination. I was also particularly affected by the indigenous peoples displays owing to where we were geographically and to the imminent Truth and Reconciliation Report from Canadian residential school survivors. I was impressed with the passion of the museum staff in answering questions and explaining the stories. The museum was crowded with people of all ages even though it was a Friday. All in all it was a very educational experience. If I lived in Winnipeg, I would buy a season’s pass. Highly recommended. In the moment, it was obvious to me that considerable progress has been made in identifying and protecting people’s basic human rights. What about the right to peace, a roof over your head, nutritious food, the right not to be bullied or stalked, silence, the clothes you where to school? Canada and the world and our local communities still have a long way to go yet. What do you think? 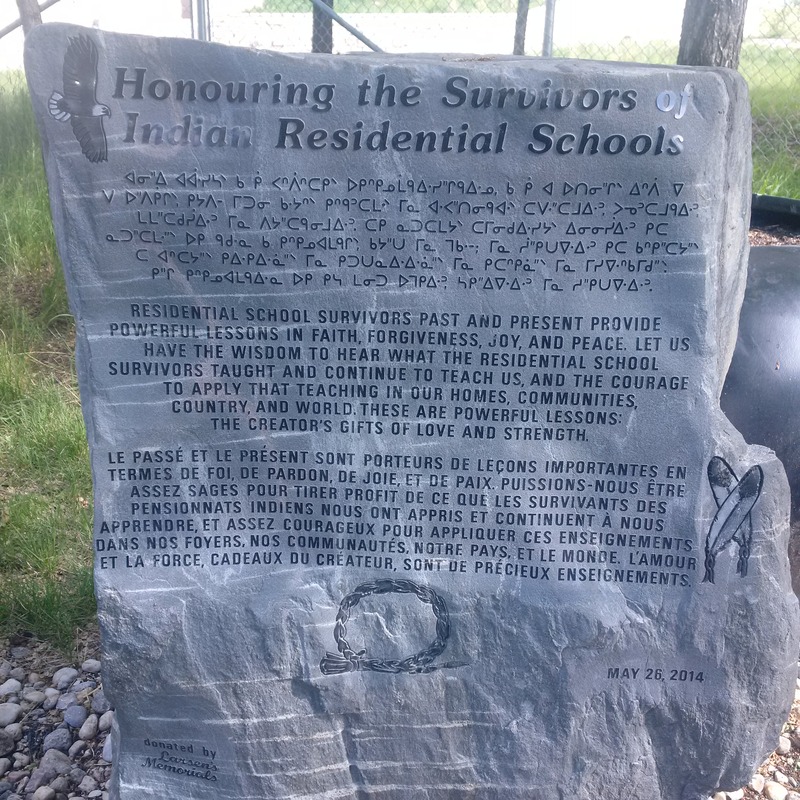 A small peace garden outside honouring the Residential School Survivors.